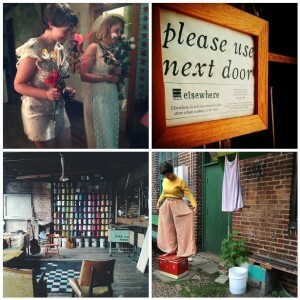 I was fortunate enough to have been chosen for a two week artist residency at Elsewhere, a living museum in Greensboro, NC. My friend Andy Sturdevant told me about Elsewhere – three stories of a former thrift store where artists from all disciplines come together to live in and work with this historic collection of….STUFF. An upholstery fabric store in the 30s, an army surplus store after that, and a thrift store after that until 1997, Elsewhere is full of the discarded objects of life. You’re not supposed to come to Elsewhere with a specific project in mind. Instead, you let the museum tell you what your project should be. Because Elsewhere is a “closed ecosystem,” nothing comes in and nothing comes out so the work you create stays in the museum and could potentially be incorporated into a future artist’s work. I can’t articulately express how much of a transformative experience Elsewhere was for me. As my friend said after I described it to him: “It’s like someone took what’s inside your brain and turned it into a real place.” It is everything I love about art-making and artists. I never felt so alive. Here’s a video about the project I did, a short story about my dad’s death.